The value of a The Canadian Press, 50th Anniversary - 5 cents 1967 stamp depends on several factors such as quality and wear, supply and demand, rarity, finish and more. Values in the section are based on the market, trends, auctions and recognized books, publications and catalogs. This section also includes information on errors and varieties and characteristics. 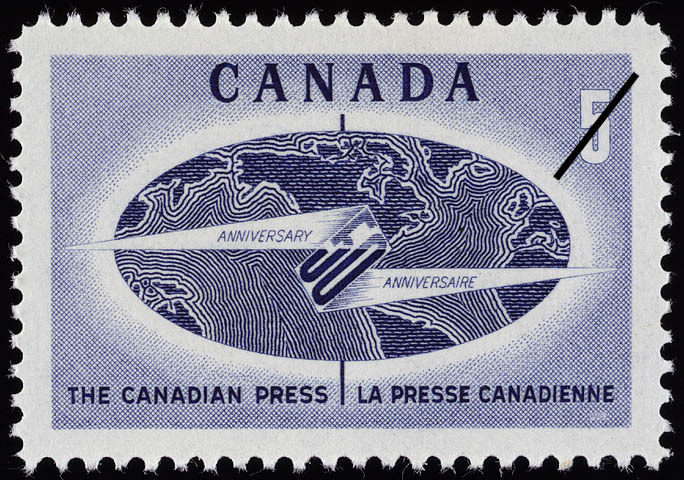 This 5 cents commemorative stamp marks the 50th Anniversary of The Canadian Press. The Canadian Press is a news-gathering and news-distributing service which has been regarded as a unifying force in Canada since its founding during the wartime stresses of 1917. Each of the 103 Canadian daily newspapers represented in its membership in 1967, whether large or small, has an equal vote in the affairs of the association and in the election of Directors. The first to hold this office was E.F. Slack, Montreal, whose term extended from 1917 to 1920. In 1951, after receiving their news in English for 34 years, the French-language members arranged with Canadian Press to set up Service in French. The designer of the C.P. stamp is William McLauchlan of Mount Albert, Ontario, who came to Canada from his native Glasgow, Scotland in 1951. It is the 1st design by Mr. McLauchlan selected for use on a Canadian postage stamp.